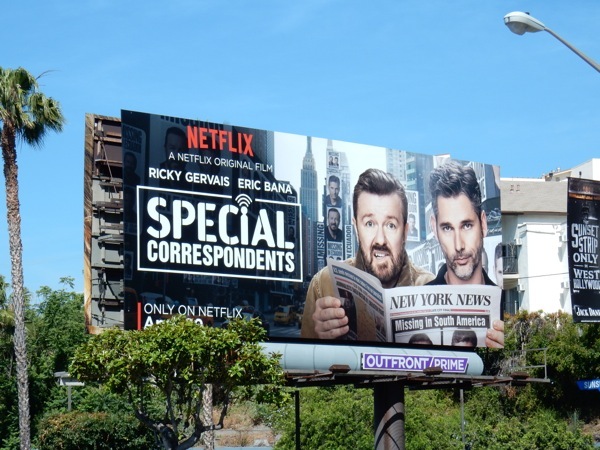 Now here's an unlikely pairing if ever you saw one, Ricky Gervais and Eric Bana in Netflix's latest original movie offering, Special Correspondents. The British comedian, best known for the U.K. original version of The Office (and hosting the Golden Globes), and the Australian actor who played 'Bruce Banner' in 2003's Hulk movie and the bad guy in the 2009 reboot of the Star Trek universe, star in the remake of the 2009 French farce of the same name. 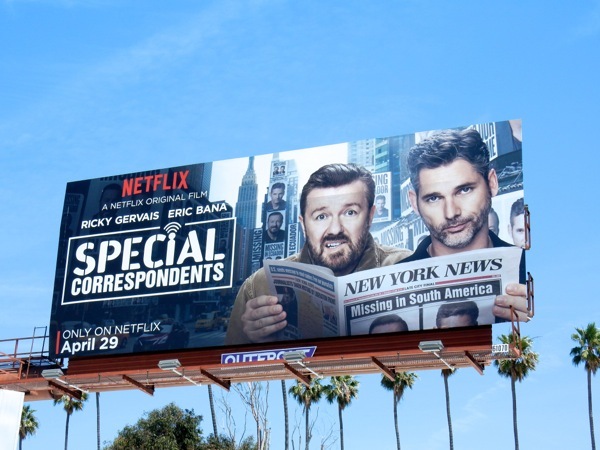 Written and directed by Ricky Gervais, the satire sees the duo of a struggling journalist and his sidekick technician hatching a scheme to fake their own wartime kidnapping which propels them into the national spotlight, whilst all the time hiding out in New York City pretending to be rebel hostages in the Ecuadorian rainforest. 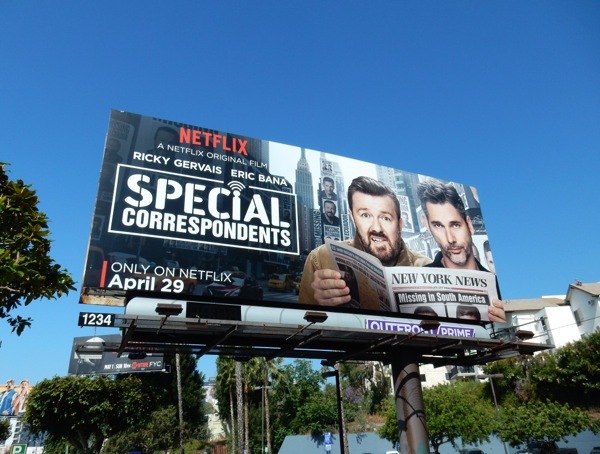 These Netflix film billboards were snapped along West Hollywood's Sunset Strip and above Santa Monica Boulevard in West L.A. on May 3, 2016. 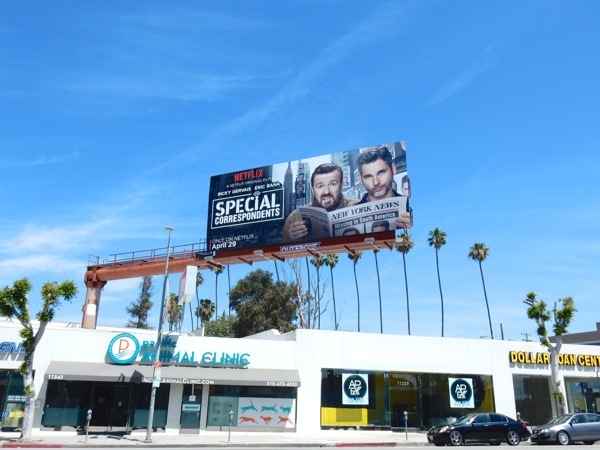 Fans of Ricky Gervais can also check him out in this 2016 Golden Globe Awards billboard and these Derek TV series billboards. 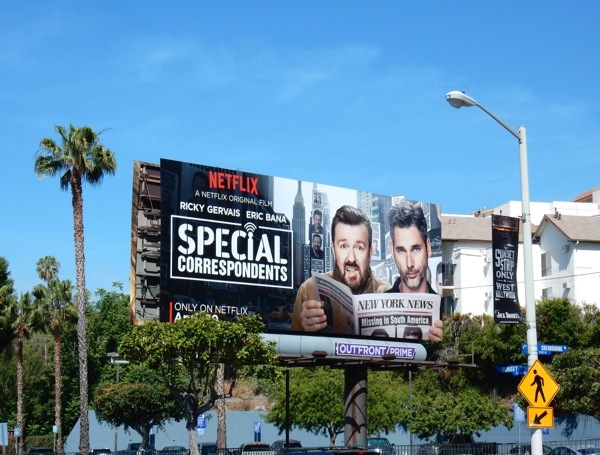 There's probably a reason this movie ended up on Netflix and not on the big screen as reviews haven't been that favourable, but the main headline has to be that the subscription streaming service continues to invest in original content constantly challenging other TV networks, cable channels and streaming platforms to up their game.